Are you looking for Twitter Marketing Services or Tweet Marketing Services in the UK for your business or company. The Twitter Marketing Services could be for Businesses or Companies in Cardiff, Swansea or Newport in South Wales, Bristol and London in England or elsewhere in the UK? Do you need help with Twitter, Advice on Twitter, Web Marketing Services or Twitter Marketing Services? Are you looking for some Twitter Strategy, Twitter Advice, Twitter Training or Twitter Inside knowledge as well as Twitter Marketing Services? If you are looking for Twitter Marketing Services, you will find the Twitter Marketing Services or the Tweet Marketing Services that you are looking for on offer from MA Consultancy in Cardiff, South Wales, UK. We can provide a monthly twitter marketing services campaign for your UK business for prices from just £50 to £100, a month (on a rolling monthly agreement) and as well as tweeting and marketing your products & services on your accounts (building targeted followers) and/or marketing your business via my own well followed accounts, we can also provide twitter strategy, twitter training and twitter advice. In total MA Consultancy managed over 100 twitter accounts which see’s a combined audience of over 200,000+ Followers (off which 100K+ are businesses), so MA Consultancy can really help with the Twitter Advertising and the online marketing of your business! For more info about our Twitter Advertising service, please see our Twitter Advertising Services – Sign Up page. Stand alone Twitter Marketing or Part of a wider Social Media Marketing Campaign? The Twitter Marketing Services we offer can be stand alone dedicated Twitter Marketing or can be part of a wider Social Media or Content Marketing Strategy. If going for stand alone Twitter Marketing Services, we can provide dedicated Twitter Marketing on your own accounts (building targeted following), or implement a twitter marketing campaign (marketing your business) on our own Twitter Marketing sites (with established audiences). If we are providing the Twitter Marketing services as part of a wider Social Media Marketing Service, we can also provide marketing services on; Facebook & Facebook Pages, Google+ and Google Business Places, LinkedIn, Pinterest, WordPress & Blogger too if required? Our Twitter Marketing Services, Twitter Services and Twitter Management Services are provided with the knowledge and expertise gained from real life, real world learning and not just out of a text book. We have been using, teaching and providing marketing services to businesses for many years now and have a number of popular twitter accounts of our own (over 100), with our most used twitter account being @WelshBiz which has over 17K followers (at the time of writing). We also built up 14,000 followers on a New Twitter Account for a new start up Business (over a few years) several years ago now @SparklyCouture and also helped to grow @Introbiz (8K followers), @PaulIntrobiz (4K followers), & @CardiffBizShow (5K followers) via services as well as Training and Consultancy over the past 3.5 years. 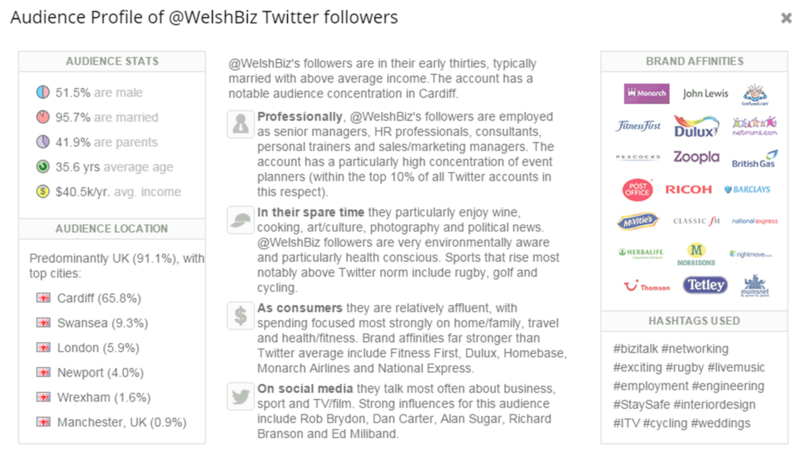 In October 2015 our @WelshBiz Twitter account was featured in the Wales Online top 250 Twitter Influencers in Wales Feature at number 132, which was put together and independently verified by Lissted’s Adam Parker (click link for more info about how the list was compiled). We have specifically used target marketing and content marketing strategies and techniques to build the right audience for us and as you can see by our demographics we have built the High Brand, Welsh Business audience that we were targeting. We have also built up an even higher end (but smaller number) Wales & UK following of Entrepreneurs on our @MAConsultancy1 account. 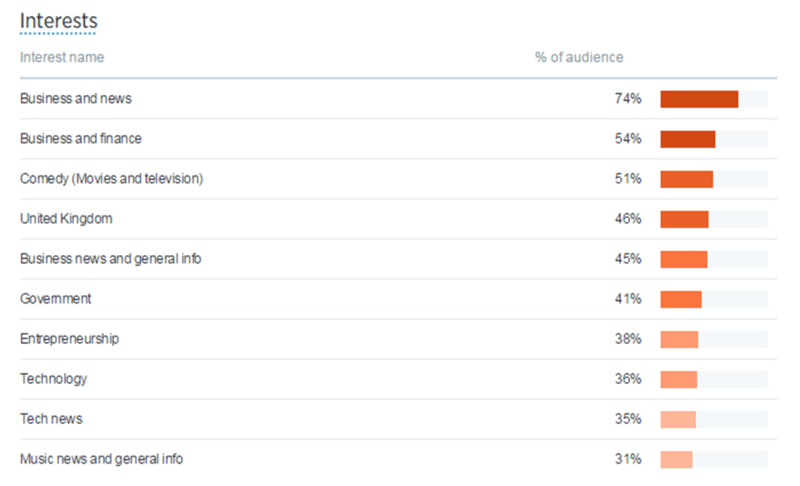 Some more demographics from some of our other accounts. Want to arrange some Twitter Marketing Services? If you are looking for Twitter Marketing or Twitter Marketing Services for businesses, please complete the online form or call us on 07517 024979. We provide Twitter Marketing Services for businesses all over Wales, but especially Twitter Marketing Services South Wales from Carmarthen, Llanelli & Swansea in the South West to Chepstow, Monmouth, & Abergavenny in the South East and everything in between including Twitter Marketing Services for Businesses in Neath, Bridgend, RCT, Pontypridd, Vale of Glamorgan, Caerphilly, Cardiff, Newport, Gwent, & Torfaen in between. We also provide Twitter Marketing Services for businesses all over England and all over the UK including Bristol, Gloucester, Swindon, Oxford, Reading, London etc. Twitter Marketing for Sports brands, events or clubs. 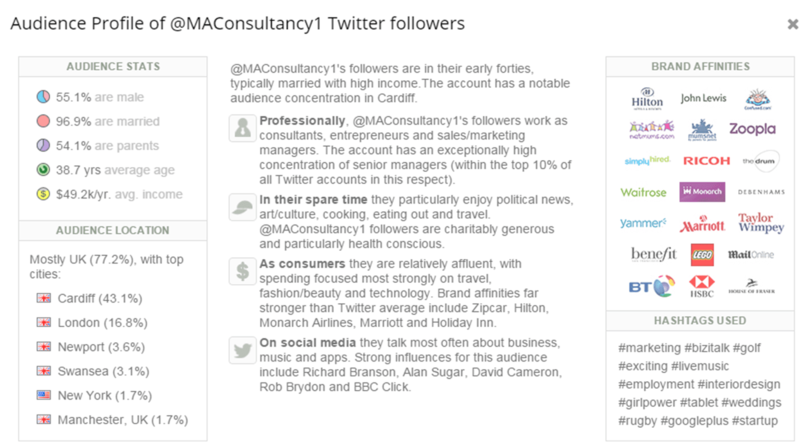 Some of the Twitter Accounts are locally focused with a big focus on Cardiff, Newport and London, whilst many of the accounts are regionally focused with a Big Focus on South Wales and South East England whilst quite a few of the accounts are Nationally focused (Wales wide or UK wide accounts). If you are looking to market to females or businesses in South Wales, London or the UK then our twitter marketing services can provide you much quicker results than what you can achieve alone because of the established following base that we can access. The Twitter Marketing & Tweet Marketing Services on offer are available without any long term contract, on a rolling monthly contract (via DD)! Getting Set Up with Twitter Marketing Services, Twitter Services or Tweet Marketing Services.